The awards season is in full swing, and plenty of celebrities make headlines with their designer frocks and shiny bling. No one, however, shone more brightly than the veteran actress Jane Fonda, who dazzled with a $3 million Gismondi 1754 diamond ring at the Screen Actors Guild Awards last Sunday night (January 27). 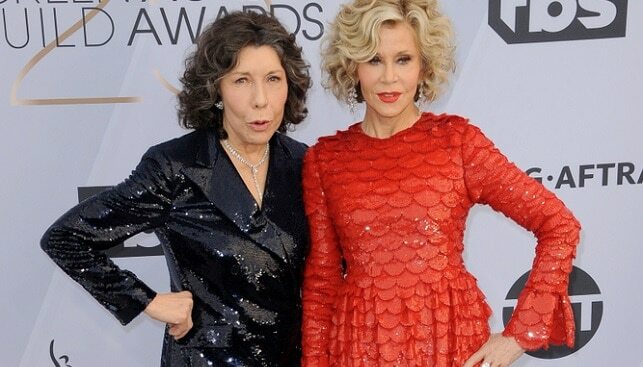 The 81-year old, star of the popular American comedy web television series “Grace and Frankie”, wore a red Valentino gown with long sleeves, matching it chandelier earrings by Gismondi. According to the company, the 40-carat earrings hold a price tag of $396,000. It was, however, Fonda’s ring that made the real splash: according to multiple sources, the veteran actress wore a $3 million, 20-carat, teardrop-shaped diamond ring. Fonda, whose acting career spans more than 60 years, did not take home the award for which she was nominated on Sunday (Outstanding Performance by a Female Actor in a Comedy Series for her role in “Grace and Frankie”). As a multiple winner of Academy Awards, Golden Globes and Primetime Emmys, we’re guessing she did not go home devastated by her loss.